So a new quilt top is finished, and I have to say I’m feeling “meh” about it. No major mistakes (unless you count two of the same fabric next to each other in a few places, but I don’t), no ugly colors, nice pattern, nothing to write (or blog) about. And maybe that’s the problem: this one just didn’t have anything that stood out in any way. The pattern is the Star Bright Quilt by Deborah Jacobs for the Moda Bakeshop. It works with a jelly roll and a basic log cabin block and I only made minor variations: I used her second layout suggestion instead of the featured one. My jelly roll did not have “light fabrics” so I mixed all my fabrics together and thus do not have the light center star. Perhaps it was that center star that made me like the pattern in the first place. And finally, to give it a little more dimension, instead of using a single solid or low volume background color, I used a variety of off -whites, ranging from grey to beige. I’ve started working on some ideas for the back, and will use some left over jelly roll strips and some of the background “whites” for the binding. 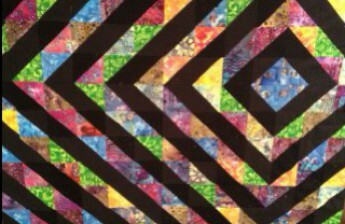 This one might wind up getting an attempt at some interesting quilting, because really I’m not sure what else to do with it! Pictures of the completed top in the next post!